Nokia has launched Nokia 8.1, Android One smartphone which is a global version of the Nokia X7. 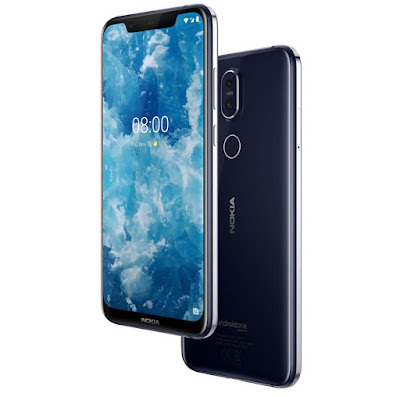 Nokia 8.1 has a 6.18-inch Full HD+ 18.7:9 aspect ratio Pure display, HDR10 video playback, 86.5% screen to body ratio powered by Snapdragon 710 10nm Mobile Platform with 4GB RAM and 64GB of internal storage. On Camera, It has a 12-megapixel rear camera rear camera with ZEISS optics, Sony IMX363 sensor, f/1.8 aperture, OIS along with a 13-megapixel secondary camera for portrait shots and zoom. The camera has AI scene detection to automatically detect 18 scenes. It has a 20-megapixel front camera with f/2.0 aperture and pixel binding that can combine four pixels to form 1.8μm large pixel. It also has AI beauty and AI portrait Mode, 6 AI studio lights, AI expressions and new dual-view mode. It has a 6 series aluminum-magnesium alloy frame, glass back, rear-mounted fingerprint sensor Packed by a 3500mAh battery with support for 18W fast charging. Nokia 8.1 comes in Blue/Silver, Steel/Copper, Iron/Steel colors priced at 399 Euros (Rs. 31,900). It will be available in UAE from December 15th priced at 1,499 Dirham (Rs. 28,805) and will be available in rest of Middle East from December 20th. India launch on December 10th.